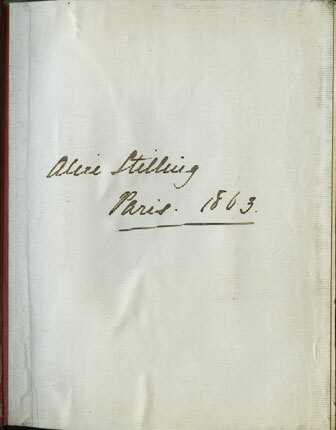 This text and the entries below the photos was most likely written by Alice Stilling. Maybe she was in Paris after travelling back to England to see her relatives or even to Germany to see her husband's relatives - following the death of her husband in Adelaide, 30 August 1863 - he was 39. Joesph Stilling was the partner with Henry Noltenius in the merchant firm of Joseph Stilling & Co. which was a significant business operating out of Port Adelaide. The album seems to be portraits of business associates and friends of the Stilling family. The business community in Adelaide formed the upper level of the local society and hence you often see albums such as these include judges and the governor. Many in this new business community had multiple businesses across land development, mines, insurance, shipping and retail. The main photographer was Townsend Duryea. Duryea had become very much part of this social and business class in Adelaide.